Editor's Note: Lukatron is a new robot and will be covering webcomics in our new Sunday Funnies column every week. If you like a particular webcomic (or draw one) and want to see it featured here, click the "Contact" link and drop us a line! 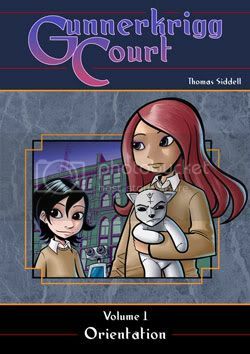 Gunnerkrigg Court is a webcomic by Tom Siddell that follows the story of a young girl named Antimony who begins attending a far-from-ordinary private school in the U.K. shortly after the death of her mother. The webcomic updates three times a week on Mondays, Wednesdays, and Fridays. It has been critically acclaimed by writers like Neil Gaiman, and has won multiple Web Cartoonists' Choice Awards including Outstanding Environment Design and Outstanding Dramatic Comic. The first volume of the comic has already been published in print format (Archaia Studios Press and Titan Books). You can pick it up here. This is one of the funnest stories I have read in a while - comic or otherwise. The characters are fresh, the storyline is well paced, and the artwork and overall feel of the comic is simply delicious. 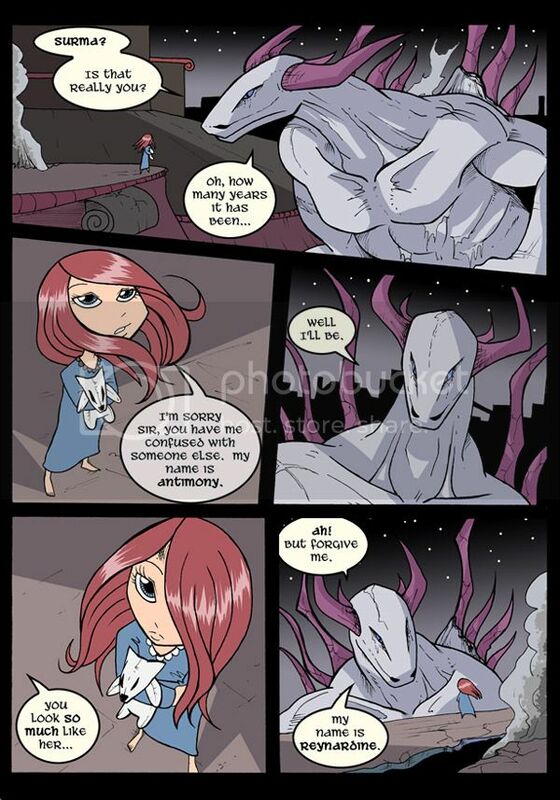 And while the mood of Gunnerkrigg Court can seem almost dark at times, the occasional lighthearted humor placed throughout the comic will make you giggle and remember not to take anything too seriously. The school that Antimony (Annie) attends is a vast Gormenghastian structure, filled with forbidden (or just forgotten) hallways and strange rooms. Outside of the school is a massive bridge crossing the divide between the Court and the ethereal and mysterious Gillitie Wood. Aside from making a few friends within her class, Annie also crosses paths with some strange and mythical beings (including a very devoted robot and a shadow that can talk). I really enjoyed the fact that Siddell seemed to have spent a little time doing his homework too. Some of Annie's new "aquaintances" include Coyote and Muut (from Cahuilla and Native American cultures), as well as the Black Dog and the Mallt-y-Nos (Welsh mythology). There are also a few based on old French folklore, such as Ysengrin and of course my favorite, Reynard. Despite all the unusual creatures that she encounters during her adventures, Annie always remains unphased. It almost reminds of Ray Bradbury's 'Elliotts', where the dark and fantastical is treated as mundane and normal. The artwork is simply beautiful (though a bit shaky at first), and Siddell's mixture of science-fiction, fantasy and mythology is effortless. Honestly, I am just in love with this comic. I find myself going back and reading earlier chapters in between updates. 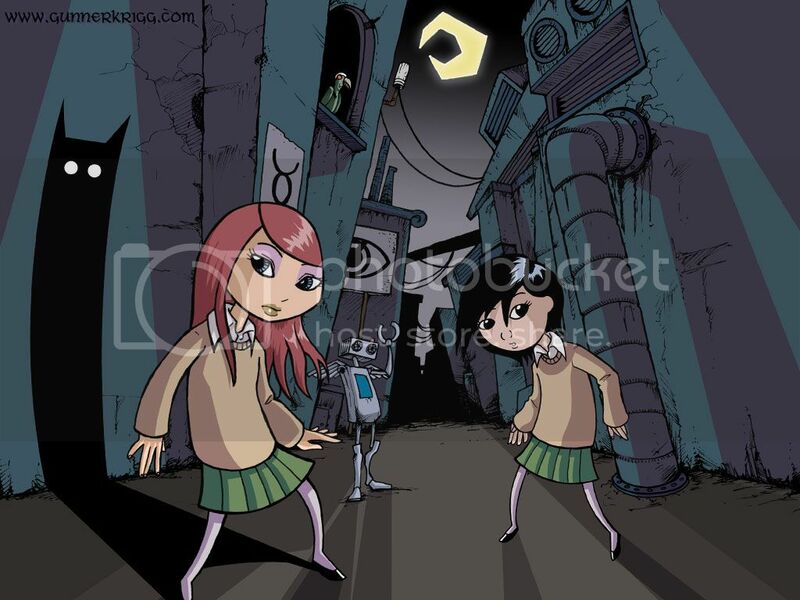 Gunnerkrigg Court is unlike anything else out there right now in the world of webcomics. Start reading it at the beginning here.